Vail resident Vera Ortegon, center, was tabbed as Mike Kopp's running mate in the Republican governor's race. 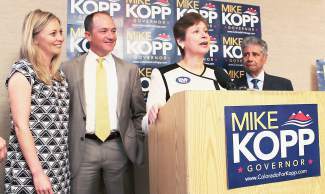 Kopp won the Republican state assembly and is the GOP front runner in a field of four candidates. The primary is June 24. Ortegon splits her time between Vail and Pueblo, where she's a microbiologist, healthcare professional, business owner, university professor and former city council member. VAIL — A Vail woman is the Republican front-runner’s running mate in the Colorado governor’s race. Vera Ortegon is running with Mike Kopp, the leader in a four-person Republican field vying to square off against Democrat incumbent John Hickenlooper. Kopp won the Republican state assembly, so his name is at the top of a list including Colorado Secretary of State Scott Gessler, Tom Tancredo and Bob Beauprez. “I can think of no better partner in this mission than my dear friend Vera Ortegon,” Kopp said when he made the announcement. Ortegon is a native of Colombia and splits her time between Vail and Pueblo, where she is a microbiologist, business owner, health care professional and professor teaching at the universities in Pueblo and Colorado Springs. She’s also on the board of directors of the Southeast Colorado Water Conservancy District. “At the dinner table we either talk medicine or water,” she said smiling. Kopp was Colorado’s Senate minority leader and recruited candidates to run for state Senate. He and some other Republican leaders tabbed Ortegon for a state Senate race. She lost, but Kopp stayed in touch. “Never in my wildest dreams did I think that an immigrant could run for lieutenant governor. What an honor!” she said. She’s no stranger to Colorado’s political landscape. She worked in economic development with former Gov. Bill Owens for six and a half years. She helped bring Intel to Colorado Springs. In all, they helped create more than 8,000 jobs in Colorado. Government, she cautions, does not create jobs. The private sector does, and government’s role is to help them. Ortegon said over-regulation is one of the roadblocks thrown up in front of businesses. She said in 2012, state Legislature created 12,000 new pages of regulations, 14,000 pages in 2013 and 16,000 this year. In Kopp’s “Blueprint for a Leaner Colorado” he proposes cutting state regulations 25 percent in two years by working with state departments. You recruit companies to Colorado by explaining that they will “not be taxed and regulated to death,” Ortegon said. Companies already in Colorado should be regularly asked, “How can we help you?” she said. Kopp has also said he wants to eliminate the business property tax as a way to attract companies and startups to the state. “Companies are always looking at the bottom line, and they go where that bottom line looks the best,” Ortegon said. She said she learned all she could as fast as she could and won a seat on the Southeast Colorado Water Conservancy District Board, one of only two elected boards in the county. “I was the most shocked person in the world when I won,” Ortegon said. She later won a seat on the Pueblo city council. Conservation and storage are the keys to Colorado’s water future, she said. But that’s only because we’ve had a big water year, she said. More storage — reservoirs — are a vital part of the plan. Wet years like this are a blessing, especially compared to 2012. She said state and federal regulations can make building more storage a problem. Kopp wants to be responsible, but he wants to reduce regulations that can block water storage, she said. “We want to make sure conservation, usage and storage are on people’s minds,” Ortegon said.